Our Summer Youth Horse Camps are back! Come enjoy old west traditions while riding cowboy style in the footsteps of our pioneers and the Nez Perce. Explore on horseback the rich history of the beautiful Wallowa Valley and surrounding mountains in Northeast Oregon - a region often referred to as the Alps of Oregon. Gain confidence as you challenge yourself to try new things. As the sun sets in the west gather around the campfire and get to know each other sharing stories, worshiping, eating s'mores, hearing cowboy poetry, and singing! See God revealed through nature, animals, and people as you each realize you are loved and made special by God. High quality safety instruction in horse care and riding skills by experienced wranglers and trained camp staff. No previous horseback experience is necessary. Plenty of instruction time in the outdoor ranch arena before trail riding. Lots of time each day with their assigned horse. Participation in horse riding games to develop confidence and skills. Fun outdoor games, campfires, Christian programming, and activities back at camp. Feel free to glance through these images of Horse Camps from the past! 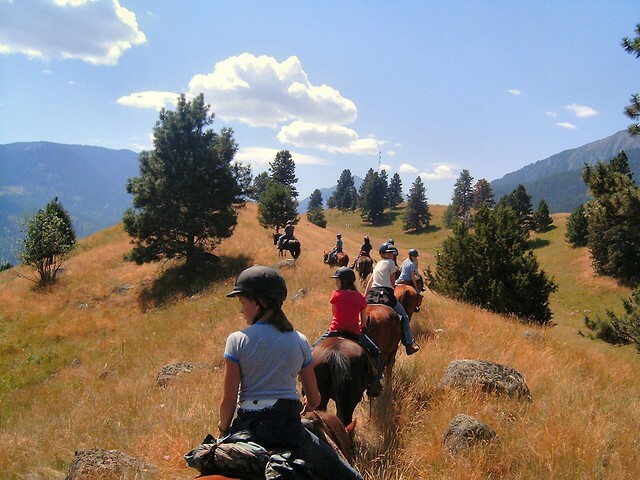 To register for Oregon Horse Camp Adventures at Wallowa Lake, check out the list events here! Oregon Horse Camp Adventures is provided in partnership with Wallowa Lake Camp, the Dave & Marianne Yost Family, and through generous donors.